Very well built, huge amount of features and nifty door opening system transforms into an extra shelf! 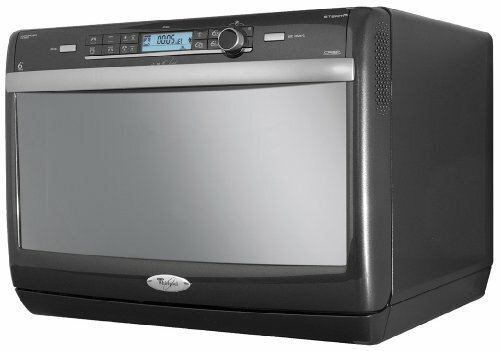 Granted it is quite an expensive purchase, but given Whirlpool's reliability and the fact this microwave is built like a proverbial tank, we feel it still offers very good value. 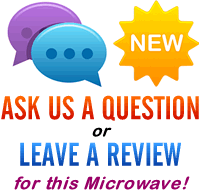 Looking to buy a high end grill microwave? The black Whirlpool JT369/MIR fits the bill, priced at around the £300 mark it's certainly not cheap, however it offers a whole host of features for the price tag (see complete list below). In terms of design it doesn't resemble a typical microwave, with the Whirlpool's controls located at the top of the door, which is bottom hinged rather than featuring the traditional left sided hinge. Due to the burly overall construction of the JT369/MIR, this provides an additional shelf-like feature, which is handy when removing hot plates from the microwave, as avoids potentially marking your expensive kitchen surface underneath. With a capacity of 28 litres it is pretty spacious, with a 36cm turntable it will accommodate the majority of dishes. Overall power output is 1000w when in microwave mode, with 8 power levels, and the built in grill delivers 1200w. Build quality is exceptional, as you'd expect, and it feels like it is built to last years of usage. The microwave controls are fairly minimalist, but once you get the hang of which button operates which function then they're easy to use. Overall the Whirlpool JT369/MIR is a high end grill microwave, which cooks and functions beautifully. Granted, it costs a lot, but over the years it should prove to be a sound investment.